With our Data Science Training in Chennai, you’ll learn concepts in expert level with practical manner. Learn how to use data science from beginner level to advanced techniques which are taught by experienced working professionals. Learn Data Science Training Courses in Chennai with Certified Trainers. Get Practical Knowledge on Data Science Concepts like Statistics, Machine Learning, AI, Deep learning and Algorithms from this Hand-on 50 hours Course. We teach you Data Science with Python/R/SAS/Excel using real-time Projects. The IT industry is booming and technological advancements like Artificial Intelligence, Cloud, Mobile applications, and the internet is moving towards an ever-growing upward graph. Every industry and organization today have high demands for software development skills. Data Science Training in Chennai which includes Python, R, SAS, and excel is the most popular course among all IT aspirants today. If you wish to master the skills in data science and have a flourishing career, it is ideal to step into Besant Technologies which is centrally located for easy access in the Velachery, OMR, Tambaram, Porur, Anna Nagar, T.Nagar, Maraimalai Nagar, Adyar, Siruseri, and thiruvanmiyur of Chennai. Why is Besant Technologies the best choice to pursue a career in the IT world? The data science course is an extremely popular field in the study of the IT world. The data science combines various software applications such as python programming, SAS, and excel programs. The data scientist makes use of artificial intelligence applications for the development and advanced modeling of the Data Science Training in Chennai. Data Science Training in Chennai combines the expertise in various disciplines and the IT world enthusiasts can easily opt for the data science course. The aspirants can be from science, math, computer science or even statistical background. Besant technologies offers you the best Data Science Training in Chennai. The course is structured in such a way that even a person with no programming background will be eligible for the course and in no time they would be a master in the field of . The demand for data scientists has increased over time and so has the employment opportunities for data scientists. There is a lot of scopes for people to enter into this growing field. Skilled data scientists who can work on SAS, Python, and R have been recruited by big multinational companies. Besant technologies have a team of experts from the industry to impart training to its students. The training modules are theoretical as well as practical based. We not only offer classroom training but live projects are worked upon under the mentorship of the expert faculty to provide a thorough Data Science Training in Chennai to all the students. Not only the students are trained but 100% placement assistance is provided to make sure that they are flourishing in their chosen field as a data scientist. The faculty members at Besant technologies are experts from the IT industry. They possess up-to-date knowledge of the technology prevailing in the market. Our trainers believe in quality learning of Data Science Training in Chennai. It aims to provide an in-depth knowledge of the Data Science Training in Chennai and the various tools and techniques used in the technology. Ensure that each student should be able to successfully apply theoretical concepts practically. Hence, practical based real-life projects are an integral part of our curriculum. After the successful completion of the data science course, all the students are awarded a certificate which is globally accredited. All reputed companies around the globe recognize the certificate provided by Besant Technologies. The Data Science Proficiency certificate holders today are working in leading job positions around the globe. We provide the best curriculum in India when it comes to Data Science Training in Chennai. We not only train you but our 100% placement services assure that you get full assistance and support to get a lucrative position in the IT industry. During our Data Science Training in Chennai sessions, various workshops are undertaken to polish your presentation skills and knowledge to help you get ready to crack the interview. We hold a record of more than 2000 students getting placed every year successfully in good positions in the IT world after the completion of the Data science course at Besant Technologies. Enroll for Data Science Training in Chennai by Besant Technologies and become an expert in Data Science concepts like Algorithm, statistics, Hypothesis testing, Machine Learning, analytics Using R, Python, Excel and SAS with the assistance of our most experienced instructors. Data Science is the New Buzzword in the global Market today; it consists of automated methods to analyze large amounts of data and to extract knowledge from it. The demand for big data analytics is increased with the future requirements of the IT; there is scope for every IT enthusiast to look into this newly developing field. More than programming, this field is filled with the purpose of troubleshooting and saving the data. This Data Scientist certification Course is designed to master yourself in the Data Science Techniques and prepare you to take up the role of the Data Scientist working with a massive amount of data to make prediction models using various statistical concepts. Using Machines Learning concepts and modelling tools, Data Scientist should help enterprises process a large amount of unstructured data and gain information to shape Business goals. This Course covers from the basics to advanced concepts of Data Science. We focused on 100% Practical and Certification Oriented Data Science training in Chennai with Placements for our Students. Most Of Our Trainers are currently working as a data scientist having more than 10 Years of industry Experienced. Besant Technologies’ Data Science programs, thus created prepares you for the most challenging and rewarding data science/analytics roles. Our career services and placement track record speaks for itself. Data Science is an interdisciplinary field focused on analyzing data through scientific methods, calculations, procedures and much more to extract meaningful data. Today, Data Science helps increase the value of businesses worldwide. Its statistics and research predict conceivable situations, risk and much more for business to stay alert. Simply, the data science world is changing the reality in business. Data scientists are those professionals who collect data, analyze and interpret to provide insights statistics. They are considered among the most talented scientists who can hypothesize, analyze data and much more to enhance a business. The data scientist has the skills to solve high-level problems. To help students acquire needful skills and to accomplish their data professional dream, we assist them in the best way. This data-driven science provides a wide range of career opportunities including data analyst, data scientist, data engineer, data architect, data manager and many more. Besant Technologies offers the most relevant and updated Data Science training in Chennai. The course curriculum has been designed by industry professionals with extensive experience to come with training in business analytics, Data Science that includes data analysis, business intelligence, cleansing, discovery, mining, transformation, deriving business insights and deploying machine learning algorithms. Understand the probability distributions in details. To work on data handling concepts. Working on integrating with other tools. Analysis segmentation and prediction using clustering. Anybody can take this Data Science course, regardless of prior skills. Knowledge of mathematics and statistics is beneficial. As the Big Data is increasing exponentially, opportunities like Data architects/Scientist has also been growing in all major industry sectors. Data Science is creating multiple jobs in all the domains across the globe. The gap between the demand and supply for the Data Scientists is huge, and hence the salaries relating to Data Science are sky high and considered to be the best in the industry. Data Scientists are considered to be the highest paid in the job market. Average salary package of Data Scientists is typically 40-300 % higher than software professionals with the same experience. The Career path of Data Scientist is long and lucrative as the generation of online data is perpetual and growing in the future. It is undoubtedly an emerging field in data analysis, which has a great link with the upcoming data software that is being prepared for the improvisation of data management. Google Trends also shows the upward trajectory with an exponential increase in the volume of searches like never seen before. This is proof that Business Analytics will be the most sought-after professional world has ever witnessed. Hence, getting the right Data Science training in Chennai and certification means you can apply for the top jobs in leading MNCs around the world. Besant Technologies offers the best Data Science certification training in Chennai. We provide everything you require including soft-skills development, resume critique, mock interview sessions, etc. Demand for Data Scientist will zoom to 28 per cent by 2020 across all industry verticals. 6k unique job postings for data scientists each week. The Data Science certification is an extremely high-in-demand certification. Besant Technologies offer Data Science Certificate after the successful completion of the Data Science course. Our Data Science course curriculum is meticulously designed and delivered matching the industry needs and considered to be the best in the industry. This helps the students to understand and retrospect, their interview readiness. The candidates can attend and successfully crack the interviews with complete confidence. We offer the best Data Science training and the reviews from our past students vouch our statement. I’m not familiar with Programming. Can I go for Data Science as a career? Yes, Familiarity with programming is desired if you want to master Data Science concepts, but not mandatory. At Besant Technologies, we start from basics of programming and Data Science with Python and Data Science with R, assuming that the candidates do not have any exposure towards programming. Our Subject Matter Experts and trainers will assist you to get a successful breakthrough in Data Science career, though you are not familiar with programming. I am Fresher Am I Eligible to Learn Data Science course? Yes, You are Eligible to Learn Data Science Course If you are interested to Learn Programming and Good with Mathematics and Business Knowledge. No minimum criteria, but need to have good knowledge of Mathematics. You need to get skilled on following, to take a deep dive in this Data science field. Will there be any backup sessions conducted? Yes, we will schedule backup sessions for the students who have missed any of the most important concepts. What is the difference between Business Analytics, Data Analytics, Data Scientist and Data Science? Our Trainers are from Top MNC’s who has more than ten years of Experience with Real-time clients. They will guide you all the way till you get confidence on the subject. Participants will get to work on multiple projects that help them to build exposure towards working on real-time industry applications of Data Science. Studying in the Data Science domain at Besant Technologies has been an outstanding learning experience for me. The trainers have always been supportive and efficient in their respective fields. They continuously provide valuable knowledge and guide us throughout. The collaboration of thorough practical knowledge along with theoretical studies makes the Besant Technologies team highly suitable for those looking to gain essential knowledge. I am extremely satisfied by acquiring the knowledge and experiences related to Data Science from Besant Technologies. 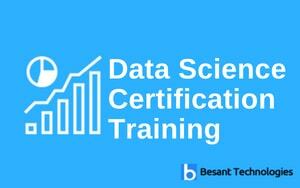 I enrolled in Besant Technologies for an Data Science Certification Training in Chennai. The LMS is very user-friendly, and the course material is lucid and easy to understand. I have enjoyed my learning experience with Besant Technologies. Today, am very much happy and satisfied having finished my Data Science course training in Chennai from Besant Technologies. The overall learning experience here is quite fantastic with the instructor being very much friendly with the students & having possessed immense subject skills he gave the best effort to make us understand the concepts. Provided a clear idea and hands-on learning approach towards the advanced concepts like R & Machine Learning. Personal attention to every student and his impressive teaching skills made us more confident in learning concepts. It was a wonderful experience of getting trained in Data Science from Besant Technologies. With an idea to upgrade my technical skill set I decided to join the Data Scientist training in Chennai program, as it is one of the most sought-after courses currently in the market. The training program at Besant technologies is excellent and well structured. The trainer was very good with the subject and conducted the class in a very informative manner. Thanks to Besant Technologies, am now confident to move up my career and take up opportunities in the Data Scientist space. The Overall Data Science Training in Chennai was nice, but I missed almost half of the sessions due to travels. I went through the recorded sessions and completed the project. One of the best place to learn Data Science Course. Friendly Environment. Live Sessions with Experts. Great course for the individuals who are looking for a better career. Related to analytics, statistics and machine learning data science course is one of the informative learning experience. This course covers the R with statistical knowledge. This Data science Course completion Certification will help to start a good career.